The Excel Flash book creator provides the ability to create Flash book presentations from Excel and Office file formats with the page turning effect and customization options. 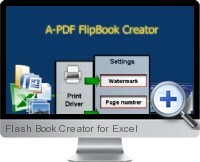 The Excel Flash Book Creator (FlipBook Creator) enables the automatic creation of Flash books with the flipping page or page turning effect from Excel files and Office file formats. The Excel Flash book creator is simple and fast to use by installing a dedicated print driver for Flash book creation and provides a range of customization options as well as batch execution capabilities. Customize the Flash book’s color schemes, styles and book title to match requirements and branding. Add a custom logo image and associated URL to the Flash books. Flash books have the ability to zoom in and out of Flash book content. Include clickable hyperlinks within text and text search. Set pages to turn automatically after a time delay or allow the user to navigate back and forth. Multiple file format support to create Flash books from Excel and other Office formats including DOC, DOCX, PPT,PPTX, XLS, XLSX, PUB, DWG, HTML and TXT. Optional watermarks can be added to pages with options including text and image rotation, transparency and color tinting. Batch process source files to create and publish multiple Flash books from various sources including command line support. Additional processes can be launched after Flash books have been created such as emailing the link to the published URL or loading an external application with parameters.